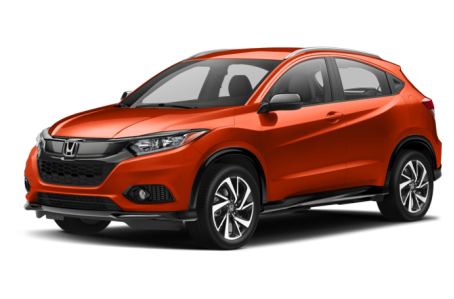 The 2019 Honda HR-V is a subcompact crossover that seats five passengers. This year, it receives mild refresh with sleeker looks. The HR-V still offers plenty of usable passenger and cargo space, especially considering it shares a platform with the Honda Fit. There is 24.3 cubic feet of cargo space behind the second row, which expands to 58.8 cubic feet with the rear seats flipped down (this beats the Fit and its 16.6/52.7 cubic feet). It competes with the Mazda CX-3 and Fiat 500X. Powering the HR-V is a 141-hp, 1.8-liter four-cylinder engine mated to a continuously variable transmission. Front-wheel drive comes standard, while all-wheel drive is available as well. Five trims are available: the LX, Sport, EX, EX-L, and Touring.